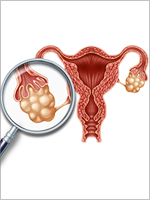 Background: Oral chemotherapy agents are increasingly used in the treatment of cancer. However, safety practices surrounding oral chemotherapy vary, and may lack standardization across different institutions. Objective: To assess the level of prescribers’ adherence to oral chemotherapy recommendations to safety standards at 2 member institutions within a large academic health system. Methods: This retrospective study included prescriptions for oral chemotherapy written between January 2013 and January 2014 within 2 institutions—A and B. Prescriptions were reviewed to determine whether they adhered to the 2013 American Society of Clinical Oncology/Oncology Nursing Society chemotherapy administration safety standards. A prescription was defined as adherent if it included ≥75% of the evaluated safety standards. The primary end point was the proportion of oral chemotherapy prescriptions demonstrating adherence to these safety standards. The secondary end points were the percentage of prescriptions from each institution demonstrating accuracy, defined as adherence to ≥75% of evaluated safety standards consistent with medication-specific prescribing information. Results: A total of 78 oral chemotherapy prescriptions were evaluated, 48 (62%) of which were adherent to safety standards and 30 (38%) of which were not adherent to safety standards. Prescriptions from institution B, all prescribed using prescription templates, were significantly more adherent to safety standards than those from institution A; 75% versus 50%, respectively, of prescriptions demonstrated prescribing adherence (P = .0237). Conclusion: Prescribers’ adherence to, and accuracy of, safety standards in prescribing oral chemotherapy is variable but may be improved by the use of prescription templates, and integration of oncology clinical pharmacists in the prescribing process. Oral chemotherapy has distinct safety risks related to prescribing practices and dispensing.1 Common medication errors associated with oral chemotherapy dispensing involve the incorrect drug, dose, and number of days supplied, as well as missed doses attributed to various reasons.3 High-risk failure modes (ie, potential process failures) that have been identified with prescribing include prescription errors from shortcuts, miscalculations, or illegible handwriting; inadequate patient education at the time of prescribing; and prescription transmission errors to the dispensing pharmacy.4 During dispensing, high-risk failure modes include data entry errors, pharmacist failure to thoroughly verify the prescriptions, and dispensing of wrong dosage form, dose, or quantity. For our study, oral chemotherapy prescribing practices from 2 member institutions—institution A and institution B—of a large health system in Maryland were evaluated. Institution A is a large, academic medical center with a National Cancer Institute–designated cancer center; it has 2 outpatient pharmacies (pharmacy 1 and pharmacy 2) that process oral chemotherapy prescriptions (Figure). Prescribers of oral chemotherapy from institution A can transmit their prescriptions to either of these outpatient pharmacies or to a pharmacy of the patient’s choice. Institution B is a community hospital with a cancer institute that is a recognized affiliate of the cancer center at institution A. As of July 2013, patients being treated at institution B who receive an oral chemotherapy prescription are serviced by pharmacy 1 at institution A. Pharmacy 2 primarily serves patients discharged from institution A. In contrast to the strictly standardized chemotherapy practices and specialized pharmacy training for parenteral chemotherapy or inpatient oral chemotherapy at our health system, there are currently no institutional guidelines or protocols in place to standardize outpatient oral chemotherapy prescribing practices. Providers at institution B generally use a prescription template for oral chemotherapy prescriptions, whereas providers at institution A do not. Institution B uses 2 oral chemotherapy prescription templates: one for capecitabine alone, and another for other oral chemotherapy agents. 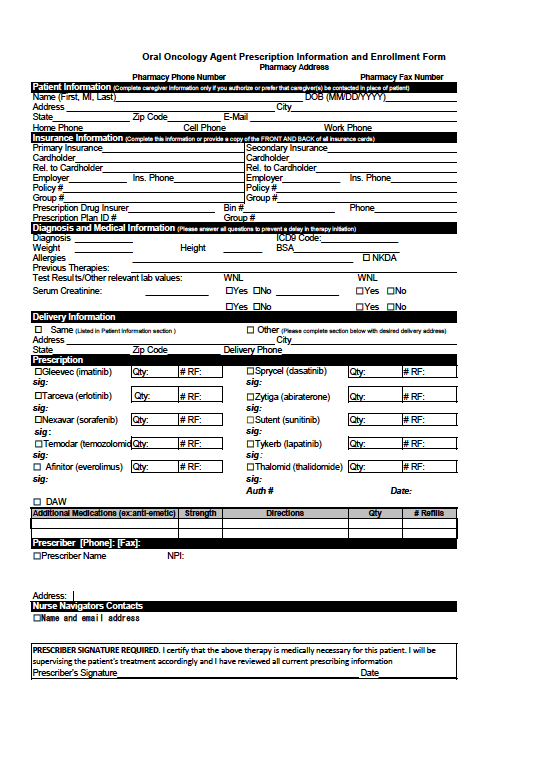 These oral chemotherapy prescription templates include fields for safety measures, such as diagnosis and other pertinent medical information (eg, body surface area, allergies, previous therapies, and laboratory values), to ensure that this information is documented and evaluated by providers (see Appendix at the end of the article). Oncology clinical pharmacists are well-integrated into inpatient chemotherapy practices and routinely assist prescribers with safe prescribing of oral chemotherapy before hospital discharge. However, currently there are no such pharmacy personnel who routinely assist with oral chemotherapy prescribed in the ambulatory care setting. In addition, the majority of outpatient pharmacists who dispense oral chemotherapy prescriptions have no formalized education in oncology. A standardized patient education program at the point of dispensing does not exist in either pharmacy at institution A. Furthermore, there is an absence of standardized telepharmacy programs and integration of pharmacists into ambulatory care clinic practices in which oral chemotherapy education and monitoring can be provided. These 2 institutions were chosen for evaluation because of the differences in their oral chemotherapy prescribing practices. The primary objective of this study was to determine whether prescribers of oral chemotherapy in institution A and institution B are adherent to oral chemotherapy safety standards. The secondary objectives of this study were to characterize present safety practices for prescribing oral chemotherapy at both institutions, and to determine the accuracy of oral chemotherapy prescriptions from both institutions. This study was a retrospective analysis of oral chemotherapy prescribing practices from institution A and institution B between January 1, 2013, and January 31, 2014. The study was approved by an Institutional Review Board, and was granted a waiver for informed consent. Prescriptions for abiraterone acetate (Zytiga), capecitabine (Xeloda), cyclophosphamide (Cytoxan), erlotinib (Tarceva), everolimus (Afinitor), imatinib mesylate (Gleevec), regorafenib (Stivarga), sorafenib (Nexavar), sunitinib malate (Sutent), temozolomide (Temodar), and vemurafenib (Zelboraf) during the study period were eligible for inclusion in the analysis. These specific agents were chosen based on the dispensing frequency at the outpatient pharmacies at our institution. Eligible prescriptions were written by providers from either institution, and were processed at one of the outpatient pharmacies at institution A. Oral chemotherapy prescriptions were excluded if they did not meet these criteria. Prescriptions were considered adherent to the ASCO/ONS safety standards if they included ≥75% of the safety standards being evaluated in this study. We based our adherence definition, ≥75% inclusion of safety standards, on reported prescription error rates,10 average reported percent adherence to evidence-based guidelines for clinical practice,11 and as defined by the authors. Prescriptions were also reviewed to determine prescribing accuracy relative to medication-specific prescribing information and Lexicomp drug information that included labeled and off-label indications. The safety standards reviewed for prescribing accuracy were diagnosis, method of dose calculation, dosage and units of measure, oral formulation, frequency of administration, administration considerations, and duration of therapy. A prescription was considered accurate if ≥75% of the evaluated safety standards were consistent with the medication-specific prescribing information. Additional information collected for each prescription included the prescribing institution, the dispensing pharmacy, the prescription format (ie, handwritten, typed, or electronically transmitted), prescription date, and whether a prescription template was used. The primary end point of this study was the proportion of oral chemotherapy prescriptions from both institutions that demonstrated adherence to safety standards, with adherence defined as inclusion of ≥75% of evaluated safety standards on a prescription. 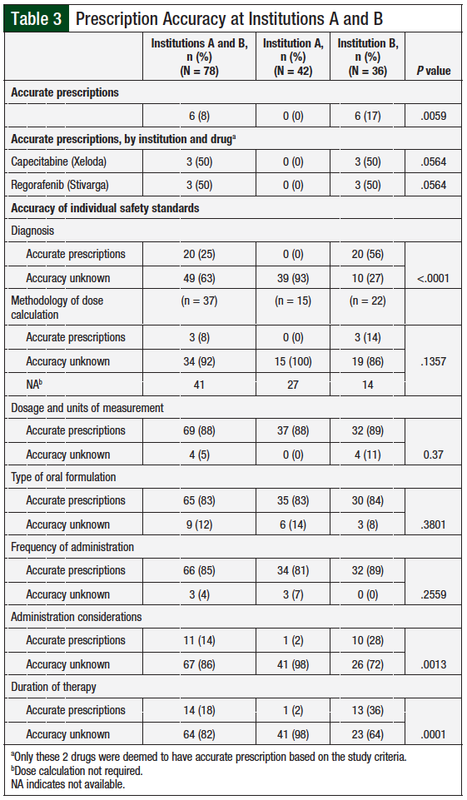 The secondary end points were the proportion of oral chemotherapy prescriptions from institutions A and B, including individual safety standards, and the proportion of prescriptions from both institutions that demonstrated accuracy (ie, having ≥75% of evaluated safety standards consistent with the medication-specific prescribing information). Using an α error of 0.05, ß error of 0.5, and population size of 100, based on a preliminary assessment of the number of potential prescriptions available for inclusion, the total sample size for this study was calculated to be 80 prescriptions. Categorical variables were assessed using the chi-square test or Fisher’s exact test, as appropriate. Statistical analyses were conducted using Prism v6.02. A total of 78 oral chemotherapy prescriptions were reviewed from both institutions (Table 2). The majority (76%) of these prescriptions were handwritten. Prescription templates were used for 38% of prescriptions, all of which were from institution B; these template prescriptions accounted for 83% of prescriptions from institution B. The most frequently prescribed oral chemotherapy agents from institution A were cyclophosphamide, imatinib mesylate, and sorafenib; the most frequently prescribed agents from institution B were capecitabine and abiraterone acetate. 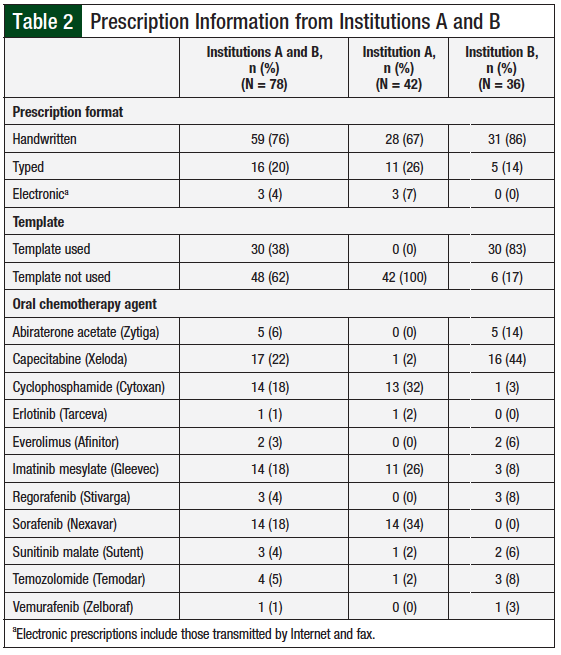 A total of 48 (62%) of all the reviewed oral chemotherapy prescriptions from both institutions were adherent to the safety standards (Table 1). Prescriptions from institution B were significantly more adherent to safety standards than those from institution A, with 75% and 50% of prescriptions, respectively, demonstrating adherence (P = .0237). All of the adherent prescriptions from institution B were prescribed based on prescription templates. Among the agents most often prescribed from institution A, prescriptions for sorafenib had the highest rate of adherence (79%), followed by cyclophosphamide (38%), and imatinib mesylate (27%). At institution B, among the agents prescribed most frequently, prescriptions for capecitabine had the highest rate of adherence (75%), followed by abiraterone acetate (60%). Certain safety standards were followed more consistently than others. Safety standards recorded on 100% of all prescriptions from both institutions included the patient’s full name, prescription date, and frequency of administration. More than 50% of all prescriptions correctly used the generic drug name, dosage and units of measurement, type of oral formulation, quantity to be dispensed, number of refills, license number of the primary prescriber, and a second patient identifier. Compared with institution A prescriptions, those from institution B were significantly more adherent to inclusion of diagnosis (P <.0001) and administration considerations (P = .0013). The methodology of dose calculation and duration of therapy were included on <50% of all prescriptions. Among oral chemotherapy agents that require dose calculation based on weight or body surface area (ie, everolimus, cyclophosphamide, temozolomide, and capecitabine), 3 (14%) prescriptions from institution B had the necessary information for dose calculation; each used a prescription template. For oral chemotherapy agents that may have varying treatment durations by day each cycle (ie, regorafenib, sunitinib, temozolomide, and capecita­bine), 15 (36%) prescriptions from institution A and 15 (42%) prescriptions from institution B specified the duration of treatment. A prescription was considered accurate if ≥75% of evaluated safety standards on the prescription were consistent with those on the medication-specific prescribing information. Overall, prescriptions from institution B were significantly more accurate than those from institution A (P = .0059). A total of 6 (8%) prescriptions from institution B written for regorafenib and capecitabine met the criteria for accuracy compared with none from institution A (Table 3). More than 80% of prescriptions from both institutions were accurate about the type of oral formulation, dosage, and units of measure, as well as frequency of administration of the prescribed agent. Prescriptions from institution B were significantly more accurate about the diagnosis compared with institution A, with 56% and none of the prescriptions, respectively, including an accurate diagnosis (P <.0001). Prescriptions from institution B were also significantly more accurate than those from institution A regarding dosage and units of measure (P = .037), administration considerations (P = .0013), and duration of therapy (P = .0001). The use of an oral chemotherapy prescription template was associated with significantly improved adherence to safety standards. Among the oral chemotherapy prescriptions that were evaluated in this study, the majority did not include the methodology of dose calculation for agents that require (1) individual dose calculations, and (2) administration considerations. These findings suggest that adherence to these 2 safety standards remains an area for improvement for prescribers at both institutions, to prevent the high-risk failure of dose miscalculation and inadequate patient education. 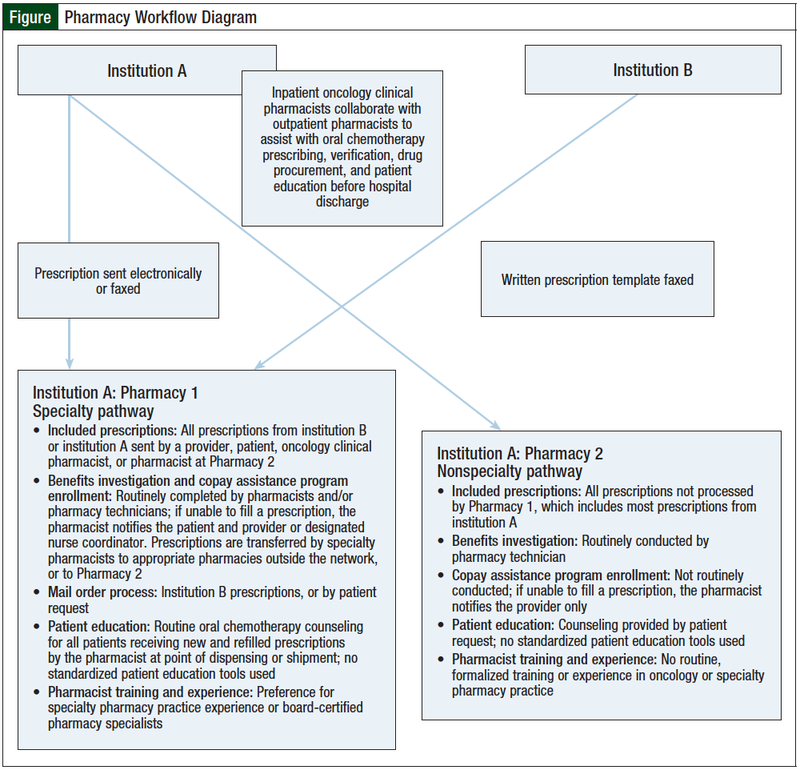 However, prescribing patterns in institution B were significantly more adherent to administration considerations than those in institution A; this may be because the capecitabine prescription template in institution B already includes administration considerations of which the patient should be aware (eg, number of dosage forms in specific dosage strengths and administration considerations with regard to meals). Compared with prescriptions from institution B, prescriptions from institution A were significantly more adherent to safety guidelines, as well as more accurate in terms of the diagnosis. This difference could be explained in part by the “Diagnosis and Medical Information” sections on the oral chemotherapy prescription templates of institution B, where the prescriber must indicate the patient’s diagnosis, and the respective International Classification of Diseases, Ninth Revision, Clinical Modification code for the diagnosis. Oncology clinical pharmacists who are knowledgeable about complex treatment protocols are in a unique position to provide the much-needed education to patients who are prescribed oral chemotherapy, especially when oral chemotherapy is dispensed via a mail order, or at a community pharmacy where medical records are limited.12,14,18,19 The National Comprehensive Cancer Network recommends that specialty pharmacies support increased communication between patients and pharmacists to improve adherence rates and identify potential safety concerns.20 This recommendation supports the need for the development of proactive medication monitoring systems to reduce adverse drug events and consequential dose adjustments for patients receiving oral chemotherapy. 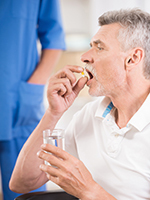 Pharmacist-led or pharmacist-integrated programs in an ambulatory care clinic, callback program, or specialty pharmacy setting have been shown to increase patient safety and medication adherence.18-30 In a 2014 study, Wong and colleagues reported that pharmacists in their program teach patients receiving oral chemotherapy about dosage and administration, side effects, potential interactions, symptom prevention and management, and procedures for safe handling and disposal of oral anticancer agents.26 A preliminary analysis of medication therapy management outcomes showed detection of mod­erate-to-severe drug interactions, identification of medication errors, and a high rate of adherence. These authors found a lack of appropriate labeling and education regarding safe handling of oral chemotherapy drugs and containers. One study also reported inconsistencies in patients’ oral chemotherapy handling practices,30 which may reflect an additional educational need that could be met by pharmacists. There were several limitations to this study. The study included a small number of oral chemotherapy prescriptions, which may limit the applicability of the results. For medications that have indications outside of oncology (eg, cyclophosphamide), if the patient’s diagnosis was not included on the prescription, it was unclear what indication the prescription was written for. In addition, we were unable to distinguish whether prescriptions were truly written by the primary oncologist, or if they were written by a fellow or a resident and then signed by the primary healthcare provider. Furthermore, because of the retrospective nature of the study, we were unable to capture safety concerns (eg, absent body surface area) that may have been resolved at the point of order verification through pharmacist−provider communication, if documentation was unavailable. Of note, the accuracy of a safety standard on a given prescription could not be assessed if the safety standard was not included on the prescription. For example, 63% of all prescriptions in this study did not include a diagnosis; therefore, the accuracy of diagnosis of these prescriptions is unknown. Similarly, we were unable to assess the accuracy of administration considerations, duration of therapy, and methodology of dose calculation on >80% of all prescriptions from both institutions, because these safety standards were missing on the prescriptions. Finally, the study may lack sufficient statistical power; we aimed to capture 80 prescriptions in the given time frame, but were only able to record 78 prescriptions. The risk for medication errors associated with prescribing, dispensing, administration, and monitoring of oral chemotherapy drugs may be linked to variability in adoption of strict safety standards.31 The results of this study suggest that further research is needed to characterize oral chemotherapy prescribing practices, and guide practice changes that will improve prescribers’ accuracy and adherence to safety standards related to oral chemotherapy prescriptions. Future directions for research may include prospective assessment of prescription adherence and accuracy after the introduction of standardized prescription templates (preferentially focusing on medications with complicated dosing and administration schedules), and capturing pharmacist and prescriber knowledge and confidence regarding the safe use of oral chemotherapy. We aim to expand the specialty pharmacy process at institution A’s pharmacies, and improve the accessibility of electronic medical records to dispensing pharmacists and the training of pharmacists. In addition, future directions include integrating oncology clinical pharmacists into the outpatient clinic setting at institution A to assist with safe prescribing, verification, dispensing, and patient education. The implementation of strict guidelines—in combination with multidisciplinary educational efforts—pertaining to prescription writing and verification, patient follow-up, toxicity management, and monitoring of adherence for patients treated with oral chemotherapy agents will greatly improve patient care. Dr Duffy has no conflicts of interest to report. Dr Cho is an employee of Novartis Pharmaceuticals. 2. Weingart SN, Mattsson T, Zhu J, et al. Improving electronic oral chemotherapy prescription: can we build a safer system? J Oncol Pract. 2012;8:e168-e173. 3. Weingart SN, Toro J, Spencer J, et al. Medication errors involving oral chemotherapy. Cancer. 2010;116:2455-2464. 4. Weingart SN, Spencer J, Buia S, et al. Medication safety of five oral chemotherapies: a proactive risk assessment. J Oncol Pract. 2011;7:2-6. 5. Weingart SN, Flug J, Brouillard D, et al. Oral chemotherapy safety practices at US cancer centres: questionnaire survey. BMJ. 2007;334:407. 6. Greenall J, Shastay A, Vaida AJ, et al. Establishing an international baseline for medication safety in oncology: findings from the 2012 ISMP International Medication Safety Self Assessment for Oncology. J Oncol Pharm Pract. 2015;21:26-35. 7. Neuss MN, Polovich M, McNiff K, et al. 2013 updated American Society of Clinical Oncology/Oncology Nursing Society chemotherapy administration safety standards including standards for the safe administration and management of oral chemotherapy. J Oncol Pract. 2013;9(suppl 2):5s-13s. Erratum in: J Oncol Pract. 2013;9:265. 8. Collins CM, Elsaid KA. Using an enhanced oral chemotherapy computerized provider order entry system to reduce prescribing errors and improve safety. Int J Qual Health Care. 2011;23:36-43. 9. Goldspiel B, Hoffman JM, Griffith NL, et al. ASHP guidelines on preventing medication errors with chemotherapy and biotherapy. Am J Health Syst Pharm. 2015;72:e6-e35. 10. Gandhi TK, Weingart SN, Seger AC, et al. Outpatient prescribing errors and the impact of computerized prescribing. J Gen Intern Med. 2005;20:837-841. 11. Grol R. Successes and failures in the implementation of evidence-based guidelines for clinical practice. Med Care. 2001;39(8 suppl):II46-II54. 12. Ma CSJ. Role of pharmacists in optimizing the use of anticancer drugs in the clinical setting. Integr Pharm Res Prac. 2014;3:11-24. 13. Charpentier MM, Orr KK, Taveira TH. Improving pharmacist knowledge of oral chemotherapy in the community. Ann Pharmacother. 2012;46:1205-1211. 14. Holle LM, Harris CS, Chan A, et al. Pharmacists’ roles in oncology pharmacy services: results of a global survey. J Oncol Pharm Pract. 2016 Feb 6. Epub ahead of print. 15. Abbott R, Edwards S, Whelan M, et al. Are community pharmacists equipped to ensure the safe use of oral anticancer therapy in the community setting? Results of a cross-country survey of community pharmacists in Canada. J Oncol Pharm Pract. 2014;20:29-39. 16. O’Bryant CL, Crandell BC. Community pharmacists’ knowledge of and attitudes toward oral chemotherapy. J Am Pharm Assoc (2003). 2008;48:632-639. 17. Halfdanarson TR, Jatoi A. Oral cancer chemotherapy: the critical interplay between patient education and patient safety. Curr Oncol Rep. 2010;12:247-252. 18. Holle LM, Boehnke Michaud L. Oncology pharmacists in health care delivery: vital members of the cancer care team. J Oncol Pract. 2014;10:e142-e145. 19. Sessions JK, Valgus J, Barbour SY, Iacovelli L. Role of oncology clinical pharmacists in light of the oncology workforce study. J Oncol Pract. 2010;6:270-272. 20. Schwartz RN, Eng KJ, Frieze DA, et al. 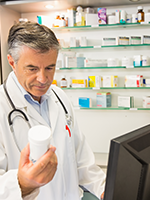 NCCN Task Force report: specialty pharmacy. J Natl Compr Canc Netw. 2010;8(suppl 4):S1-S12. 21. Valgus JM, Faso A, Gregory KM, et al. Integration of a clinical pharmacist into the hematology-oncology clinics at an academic medical center. Am J Health Syst Pharm. 2011;68:613-619. 22. Parsons LB, Edwards K, Perez A, et al. 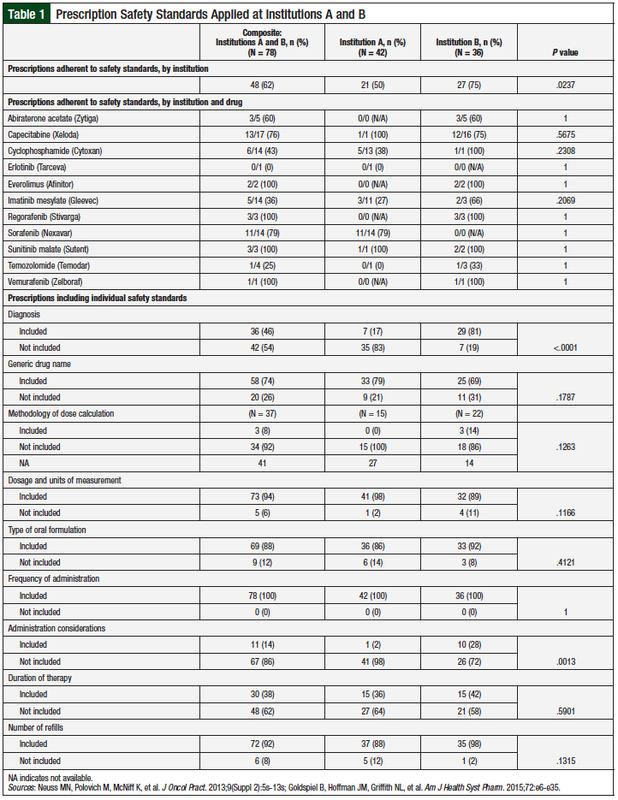 Positive outcomes associated with a pharmacist-driven oral chemotherapy program. J Hematol Oncol Pharm. 2015;5:99-108. 23. McCue DA, Lohr LK, Pick AM. Improving adherence to oral cancer therapy in clinical practice. Pharmacotherapy. 2014;34:481-494. 24. Mancini R, Kaster LM, Vu B, et al. Implementation of a pharmacist-managed interdisciplinary oral chemotherapy program in a community cancer center. J Hematol Oncol Pharm. 2011;1:23-30. 25. Mancini R, Wilson D. A pharmacist-managed oral chemotherapy program: an economic and clinical opportunity. Oncology Issues. 2012;27:28-31. 26. Wong SF, Bounthavong M, Nguyen C, et al. Implementation and preliminary outcomes of a comprehensive oral chemotherapy management clinic. Am J Health Syst Pharm. 2014;71:960-965. 27. Lam MS, Cheung N. Impact of oncology pharmacist-managed oral anticancer therapy in patients with chronic myelogenous leukemia. J Oncol Pharm Pract. 2016;22:741-748. 28. Patel JM, Holle LM, Clement JM, et al. Impact of a pharmacist-led oral chemotherapy-monitoring program in patients with metastatic castrate-resistant prostate cancer. J Oncol Pharm Pract. 2016;22:777-783. 29. Birner AM, Bedell MK, Avery JT, Ernstoff MS. Program to support safe administration of oral chemotherapy. J Oncol Pract. 2006;2:5-6. 30. Trovato JA, Tuttle LA. Oral chemotherapy handling and storage practices among Veterans Affairs oncology patients and caregivers. J Oncol Pharm Pract. 2014;20:88-92. 31. Elsaid KA, Garguilo S, Collins CM. Chemotherapy e-prescribing: opportunities and challenges. Integr Pharm Res Prac. 2015;4:39-48.